This church sits in a wonderful spot, right on the Thames riverbank. 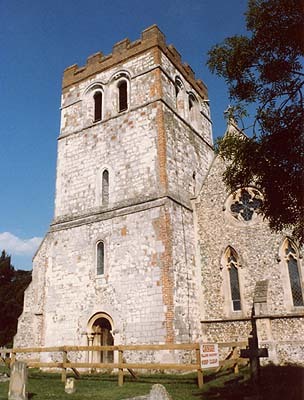 The huge chunky Norman tower dates from around 1175 and internal fittings include a brass of Thomas Crekett (1517) with missing wife; but the rest of the building largely dates from the Victorian restoration of 1849. Fortunately, the exception is the late 16th century south chapel. This southern chapel is known as the "Hoby Chapel" - an obvious name in light of the fact that it is filled to overflowing with a spectacular collection of monuments to Hoby family, who lived at the adjoining manor of Bisham Abbey. The irrepressible Lady Elizabeth Hoby organised both her memorial and funeral down to every last detail, even writing to the College of Arms to confirm her heraldic rights and privileges. Alongside her recline - beneath one of the earliest monuments in the country of this type, probably commissioned in France - her husband and brother-in-law with Hobby (hawk) crests playing on the family name; and a swan (the Carey family crest) covered monument to her daughter-in-law, Margaret Carey Hoby. This lady was Queen Elizabeth I’s cousin and she was visited at the Abbey by her royal relative. The early 17th century heraldic window traces the Hoby family history, though you could be forgiven for thinking it depicted the red lozenges of the Montacute Earls of Salisbury who preceded the Hobys at Bisham Abbey. They are actually the Hoby weaving shuttles. The Vansittart-Neales took over the manor in more recent years and are remembered by a sad monument to their heir, an Eton boy who died aged only fourteen in 1904. He is represented along with his dog, Norman, sculpted from life. He was one of several young Vansittarts who died in tragic circumstances, giving rise to talk of a curse on the family (or the house). The northern Williams chapel features a Tudor monument brought from Anglesey for Owen Williams of Temple House (built on the site of the Templar mills) who died in 1832.